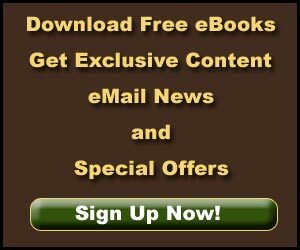 Crater Lake: A Crown Jewel - Explore! 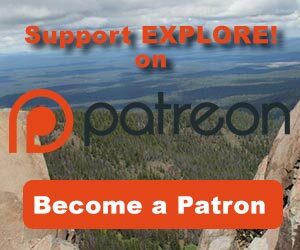 Crater Lake: A Crown Jewel - Explore! Crater Lake was formed in the largest known eruption of a Cascade Range volcano, Mount Mazama. The peak of Mount Mazama is estimated to have been about 12,000 feet in elevation before the massive explosion 6,865 years ago (based upon carbon dating). That explosion moved 50 cubic kilometers of material into the air. The emptied magma chamber below the mountain then collapsed leaving the bowl that now holds Crater Lake. More recently, around 1,000 years ago, continuing eruptions formed Wizard Island and two other volcanic cones that are hidden beneath the water. The lake averages more than five miles in diameter, and is surrounded by steep walls that rise up to 2,000 feet above its surface. The peak of Wizard Island is 764 feet above the lake surface. Native Americans witnessed the explosion and described it as the result of a battle between Llao, Chief of the Underworld and Skell, Chief of the Above World. Llao’s home, Mount Mazama, was destroyed and Skell was victorious. Crater Lake was first visited by white men on June 12, 1853 when three gold prospectors, John Wesley Hillman, Henry Klippel, and Isaac Skeeters, were awed by it’s deep blue color. The color of the water is striking to all observers. It is the product of the lake’s great depth, the purity and clarity of its water, and the way solar radiation interacts with water. Water molecules absorb the longer wavelengths of light better (reds, oranges, yellows, and greens). Shorter wavelengths (blues) are more easily scattered than absorbed. In the deep lake, some of the scattered blue light is redirected back up to the surface where we can see it. Around the edges where the water is less deep, some of the unabsorbed green sunlight is reflected offering a different shade of color. Crater Lake is one of the clearest lakes in the world. On June 25, 1997 scientists recorded a record clarity reading of 142 feet – readings of 120 feet are common. Lake temperature varies between 32 and 66 degrees at the surface. More than 260 feet below the surface, the water remains a constant 39 degrees year-round. The lake is not devoid of life. Scientists have identified 157 species of phytoplankton and 12 species of zooplankton in the lake. A complex underwater moss colony thrives on a platform of submerged volcanic rock around Wizard Island. At the bottom of the lake, communities of bacteria exist around at least two areas of hydrothermal activity. Rainbow trout and kokanee salmon thrive in the lake, the result of stocking between 1888 and 1942. Once believed to be bottomless, a U.S. Geological Survey crew carried a half-ton survey boat up the mountain and into the lake so they could take soundings. They determined that the lake was not bottomless, but 1,996 feet deep. Sonar readings made in 1959 pegged the depth at 1,932 feet and the most recent measurements indicate 1,943 feet. 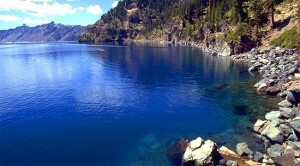 That makes the lake the seventh deepest lake in the world and the deepest in the United States. The depth does vary over time, but not much. Evaporation and precipitation (mostly snow) stay in close balance to hold the lake level fairly steady. To really understand the lake requires a combination of views from various points along and above the rim drive and an interpretative boat tour of the lake. 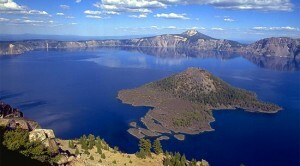 Crater Lake boat tours are given daily from July to mid-September, weather permitting. Some reservations are available for each boat and first-come, first-served tickets are sold at the Cleetwood Cove Trailhead parking area. Getting to the boat requires hiking 2.2 miles round trip on a strenuous trail! Please check with the Park for the most current boat tour schedule and reservations. The trail to the boat, Cleetwood Trail, is the only way to get to the lake’s surface. Whether you take the tour or not, you’ll get a whole new impression of Crater Lake from lake level. William Gladstone Steel is widely recognized as the father of Crater Lake National Park. After a twenty-mile hike from Fort Klamath, Steele first laid eyes on the lake on August 15, 1885. He later reflected: “Not a foot of the land about the lake had been touched or claimed. An overmastering conviction came to me that this wonderful spot must be saved, wild and beautiful, just as it was, for all future generations, and that it was up to me to do something. I then and there had the impression that in some way, I didn’t know how, the lake ought to become a National Park.” After 17 years of Steele’s promotion and lobbying, Crater Lake National Park was created on May 22, 1902 when President Theodore Roosevelt signed the bill giving Crater Lake national park status. Steele’s notion of ‘wild’ does not equate to our current notion of Wilderness. He was instrumental in bringing automobile traffic to the rim with his support of construction of the rim drive, completed in 1918. He supported the Crater Lake Lodge that was opened on the rim in 1915. In addition, he named several park landmarks including Wizard Island, Llao Rock, and Skell Head. He also served as the second superintendent of the Park. © 2010, Anders Tomlinson, Used With Permission. While Crater Lake is clearly the crown jewel of the landscape, there is much more to the Park than the lake. The Park comprises 183,224 acres. Ninety percent of the Park is managed as back country and visited by few people. Still, there are 90 miles of maintained trails and 74 miles of paved road, including the 33 mile rim drive that circles the lake. There are numerous volcanic peaks including several with trails to the top: Mt Scott (at 8,928 feet, the highest peak in the park), Union Peak (7,709 feet), Crater Peak (7,263 feet), Garfield Peak (8,054 feet), The Watchman (8,019 feet), and Wizard Island (6,940 feet). Several other trails cross the volcanic landscape. They include Pumice Flat Trail, Stuart Falls Trail, Godfrey Glen Trail, Pacific Crest National Scenic Trail, Castle Crest Wildflower Trail, Cleetwood Trail, Annie Creek Trail, Lightening Springs Trail, Bald Crater Loop Trail, Bert Creek Trail and others. Spectacular waterfalls including Plaikni Falls, Annie Creek Falls, Duwee Falls, Upper Annie Falls, Vidae Falls and many that are unnamed dot the landscape. Geologic features like The Pinnacles of Pinnacle Valley, the Colonnades of Munson Creek, the Phantom Ship, Pumice Desert, Sphagnum Bog, and many canyons, cliffs and bluffs offer additional points of interest. There is quite a variety of life in the Park with 700 plant, 52 mammal, eight amphibian, four reptile, five fish, and 151 bird species that reside in the park at least part of each year. Winter brings a whole new face to the Park with some of the heaviest snowfall in the country – averaging 533 inches (over 44 feet!) per year. Although most park facilities close for the winter, the park’s south entrance is kept open allowing automobile access to the rim. 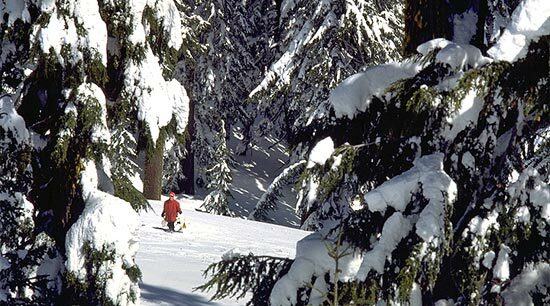 World class opportunities for cross-country skiing and snowshoe hikes make Crater Lake a winter wonderland. There is no public transportation to Crater Lake, so you will need a car. You can fly into Medford (80 miles away) or Klamath Falls (60 miles away) , Oregon. You can also take AmTrak’s Coast Starlight rail service to Klamath Falls. Once in Klamath Falls or Medford, car rentals are available. Bicyclists frequent the park, so if you are in particularly good shape you might like to take the climb to the rim and circle the lake. If you are driving from Medford, take Route 62 north and east to the park’s west entrance. If you are driving from Klamath Falls, take US-97 north to Route 62 to the park’s south entrance. Typically the north entrance to the park opens sometime in June and closes sometime in early November due to snow. For up-to-date conditions, call the park at 1-541-594-3000. To get to the north entrance from Roseburg, Oregon, take Route 138 east; from Bend, Oregon take US 97 south to Route 138 and head west to the north entrance. Crater Lake in particular and the National Park in general offer the finest scenery in the world. You can create any level of adventure you wish from a brief visit to the rim to a winter camping trip in the backcountry. The variety in the Park is outrageous. Rock, water, vegetation, wildlife and human constructs like roads, trails and buildings offer a range of activities. 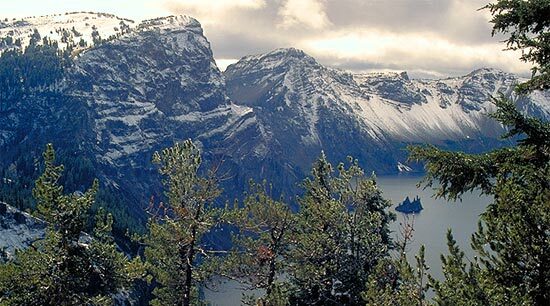 The history of Crater Lake and the Park, beginning nearly 7,000 years ago, is fascinating. That makes a lot of history and it is interpreted for the park visitor in many ways. Kids will love hiking to lake level and riding the tour boats. There are also several short trails, exhibits, ranger-led activities and other things for kids to enjoy. 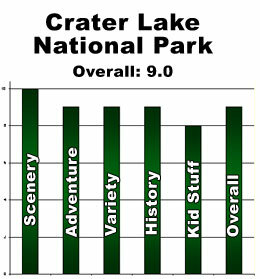 Overall, I gave Crater Lake National Park a rating of 9.0. If you’ve been there and would like to express your opinion, please use the comment form below. All the photos in this article are ©2010 by Anders Tomlinson and used here with his permission – all other rights reserved. Anders also assisted with the research for this article. The text was written by Jerry Haugen, Pathfinder, and is ©2010 Global Creations LLC, all rights reserved.